‘Tin soldiers and Nixon coming, We’re finally on our own’. American President Trump just ordered a military strike on Syria. Or so we are told. Did they? I don’t know. We are told the US mercenaries fired 103 Tomahawk cruise missiles at Syrian targets that allegedly manufactured or stored chemical weapons. The Russians claim their defense systems installed in Syria shot down 70 of these missiles. Syria claims there never was a chemical attack. It seems to me that if a chemical weapons warehouse was blown up by a Tomahawk missile, these deadly chemicals would be released into the air. None has been reported. It also seems odd to me that given Syria boasts of having a population density of one person per every two-squared kilometers, that no one was killed or injured. Given that each missile cost the american taxpayer over a million dollars, 103 missiles cost over $103 million dollars to launch and the end result being a few demolished buildings seems preposterous. This is especially true given what we ‘know’ about 9/11. That is, the US could have used a couple of old planes to remotely fly into these buildings thus causing a fire which would be followed by a perfect implosion of the buildings thus causing even less harm to anything nearby. Wouldn’t this have been a lot cheaper? And where did the US get its chemical weapon intel? Defense Secretary Mattis admits that ‘evidence’ of a chemical weapon attack in Syria is non-existent. Yet, he believes an attack happened because of what he read on ‘social media’. With the Syrian false flag being the most recent example of the people, the governed, getting snowed by lies, we should not forget the poisoning of the Skripals. A video was released showing the UK authorities readying the bench on which Mr. Skripal and his daughter were found unconscious for removal. Obviously with such a powerful Russian made nerve agent used as the poison, the bench could well be contaminated. The UK authorities took all precautions. Several workers were outfitted from head to toe in hazmat suites. There were carefully wrapping the bench in some sort of clear wrap to limit possible contamination. That’s when the video clearly showed a pigeon walking past the workers and the bench in question. The pigeon was not wearing a hazmat suit. The pigeon appeared to be perfectly fine. Our slave owners will go to great lengths to carry on their theatre of the absurd. Sadly, the governed are stupid enough to believe their government minders. ‘America’ is now a joke. Truth has been exterminated so the rich can get richer, the government can grow more powerful, and the slaves can argue over social injustice. The result is world with rules and laws being applied differently to different groups. For example, the american judicial system a few years ago fined a Christian bakery in Oregon $135k for refusing to make a wedding cake for a gay couple whose lifestyle the bakery disagreed with. Yet, Bank of America and several other banks, are now refusing to do business with gun manufacturers citing a moral conflict. It seems to me that a group of people who consider themselves to be members of a ‘nation’ should all adhere to the same laws. Clearly, this is not the case in the US. As I always find, I have a solution. These gun companies should appoint a gay person as CEO. Better yet, appoint a gay transgender non-Christian person of color who is privileged in today’s america to choose a letter to identify their sexual orientation. Then the banks would have to do business with the gun manufacturers. You’re welcome! The poorly informed ignorant masses may be wondering what all this military involvement is about. Again, allow me to help. It is about enslavement. Consider the following. By the end of year 2000, there were only seven countries without a Rothschild international central bank in charge. Those countries were: Afghanistan, Iraq, Sudan, Libya, Cuba, North Korea, and Iran. And again, who are the mortal enemies of the US? Yes, each of those countries are on the list. By 2011, only three countries had still not surrendered: Cuba, North Korea, and Iran. Now readers know the targets of the US military. Today, North Korea is the last holdout. They too, will soon surrender, bow down, and worship at the alter of the Satan’s debt printing press. In return, we slaves are treated to stock indices that cannot fall. The central bankers will see to that because it keeps their rich supporters happy. 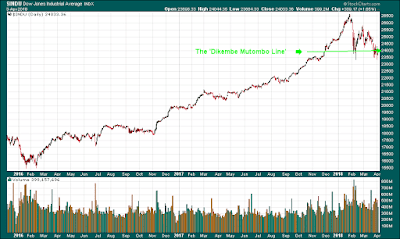 As I have written in previous articles, the Dikembe Mutombo line (Dow 24k) is still intact. Sellers who worry about hundreds of trillions in world debt, slow economic growth, high equity valuations, rising interest rates, ebbing QE, and bubbles everywhere, will try to sell down stock prices. They will be met at the Dikembe Mutombo line at Dow 24k with a ferocious buying volley from the central bankers. This will no doubt be followed by a finger wagging. Don’t try it! The slaves don’t set prices. Slave owners set the prices! Take a look at the chart below. I shows one year of activity on the Dow Jones Industrials. 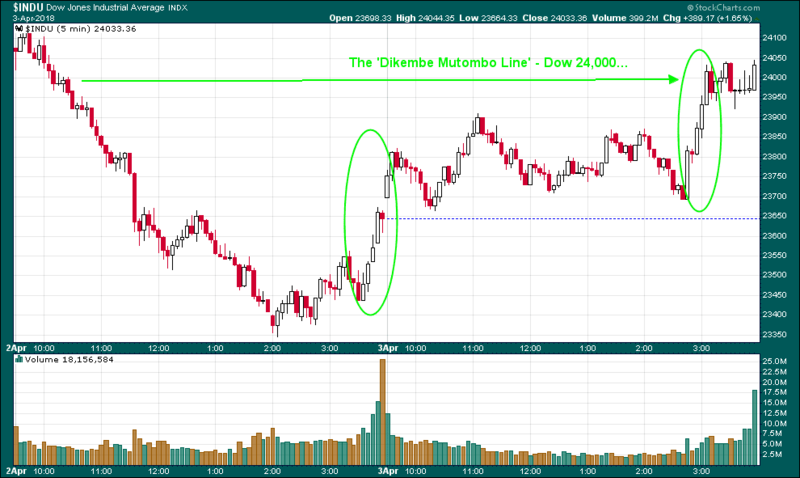 I have marked the chart with the obvious Dikembe Mutombo Line at Dow 24k. Clearly the Fed will defend this line with great determination. Why? Who knows? Who cares? America is a joke! It is the great ‘Nanny State’. The other green line shows a descending series of lower highs thus creating a bearish descending triangle. The Fed of course helped draw this formation with their spirited defense of Dow 24k. Over the next few days, we will see how serious the Fed is about continuing the stock bubble. This descending triangle will have to be destroyed by a pretty good rally. The Fed will need to engineer a series of higher highs and higher lows to get their shills of TV and print talking about the new ‘uptrend’ in stock prices. Nothing else really matters. Governments no longer represent the people. They represent the banksters. We are finally on our own. The Federal Reserve Impersonates Dikembe Mutombo! NBA fans will remember Dikembe Mutombo as the former defensive-minded center who carved his niche in the league by blocking shots. Upon swatting a shot away, Dikembe would shake his head ‘no’ and wag his forefinger back in forth at his opponent as admonishment for even attempting a shot near his presence. See the first chart below. This basically shows us the winning, rising unabated pattern of the DJIA since President Trump was elected. With a steady rise in stock prices, the Fed and their PPT arm has been quite. No need for intervention. Besides, the Fed has been buying ‘assets’ (stocks) like all the other central banks. They announced an end to this policy at the end of 2017. Stock price enjoyed another bubblicious month in January and then there was a pin prick. The Fed raised the Fed Funds rate and promised more. The yield curve compressed more and investors sold down the stock indices. I have marked the ‘Dikembe Mutombo Line’ in green. February was a busy month for the Fed as another wave of selling hit the Dow. 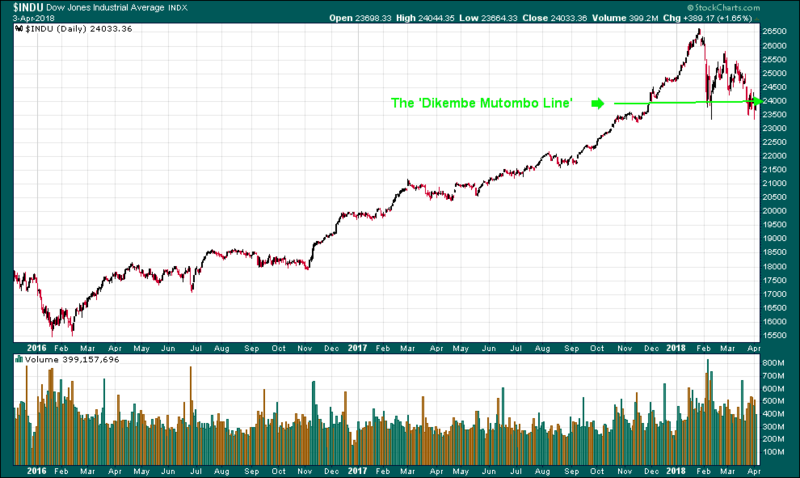 This time, the selloff did not even make it to the ‘Dikembe Mutombo Line’. The selling was abruptly blocked and back up went the Dow. The forefinger was again wagging. You could almost hear them on Wall Street. “On Comet! On Cupid! On Donner and Blitzen!” Wait a minute, that was a different ‘Santa Claus’. The point is that everyone is so enamored with an ever-rising stock index value that no one seems to care that the Federal Reserve constantly forces stock prices higher at arbitrary levels. True capitalism cannot function with constant Fed meddling. 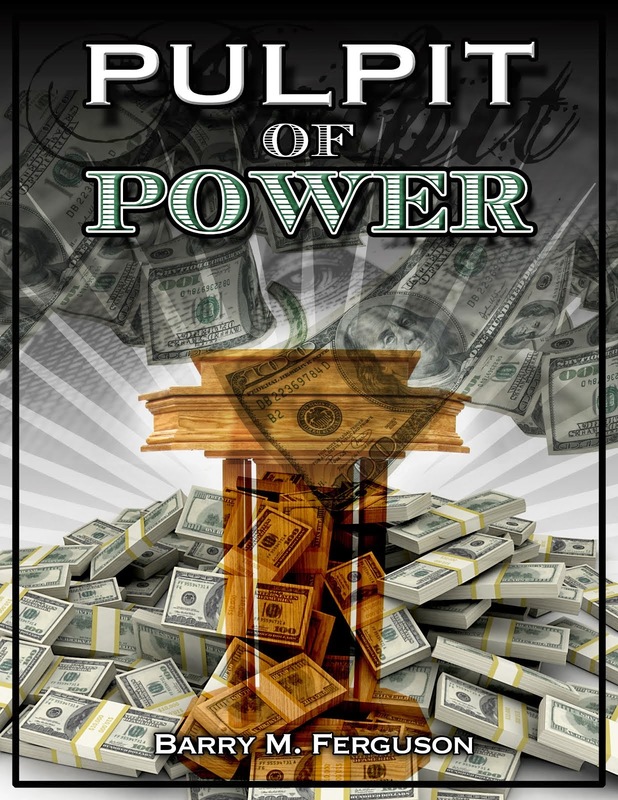 True prices for anything cannot be discovered with constant Fed meddling. A fair economy cannot ever be realized with constant Fed meddling. Capitalism this is not!! Yet, another bout of selling hit the Dow as the calendar turned to April. Another sign that the Fed is active in stock pricing is when a month is about to expire with steep losses, like February of 2018, the PPT instigates a massive ‘last day of the month rally’. Invariably, this leads to a beginning of the month, April, selloff. See the next chart below. It is a picture of the Dow for the past two days (Monday 4/2/18 and Tuesday 4/3/18 in 5-minute bars). This 2-day chart shows the PPT in action. Monday was the first day of the month following the PPT’s nice ‘end of the month rally’ in March. Naturally, stock prices plunged. Down 700 points or so with only a few hours left in the trading day, stock indices suddenly sprang to life! With so little time to work a miracle rally, the PPT did spur on a nice 300-point rally in the last 30 minutes of trading! 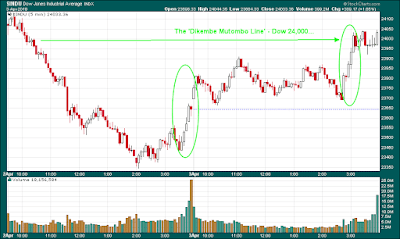 Again, I have drawn the ‘Dikembe Mutombo Line’ in green along the Dow 24,000 level. This is the Fed’s target for setting stock prices. Tuesday was very wild. There were a couple of intraday 200-point selloffs immediately followed by 300-point rallies culminating in the nice 300-point rally at 3 PM. That brought the Dow to what level again? Yes, 24,000. Dikembe was again wagging his finger. So, it only took the Fed’s PPT less than 6 hours of trading time to basically erase a 700-point selloff. Whew! One quick point. With all that wild action, one would think a so-called ‘volatility index’ like the VIX would rise. It didn’t. It fell. So again, the VIX pricing has nothing whatsoever to do with rapidly rising or falling stock prices. It is priced from the value of put options. The Fed, the PPT, drives up stock prices using call options in massive waves thus killing the value of puts thus killing the VIX. What’s so special about Dow 24,000? I have no idea. But this is the only thing investors need to know. The Fed runs everything. America does not have a stock ‘market’. America does not enjoy pure capitalism. The Federal Reserve is constantly setting prices. What investors have to look for is a sign from the Fed that they are impersonating Dikembe Mutombo to reject any selling attempt on the part of investors so that the Dow pricing will conform to the level the Fed feels comfortable. My guess is the Fed will always step in when selling looks poised to tank the derivative market. They steal tax money from the citizens, drive up stock prices, and their bankster friends get rich. Welcome to America! A follow-up. I literally cannot write this fast enough. We all know that stock prices are at least ‘elevated’ (even in the Fed’s opinion). The country is fractured on many faults. US troops are in 75% of countries throughout the world killing and destroying everything in their path. For brevity, we could all agree that there are many reasons stock prices could legitimately fall. Yet, they will not be allowed to do so. On Wednesday, the Dow opened up down some 400 points below the Dikembe Mutombo Line. We all know what happens next. Enjoy the rally back above 24,000. Enjoy the american clown show!